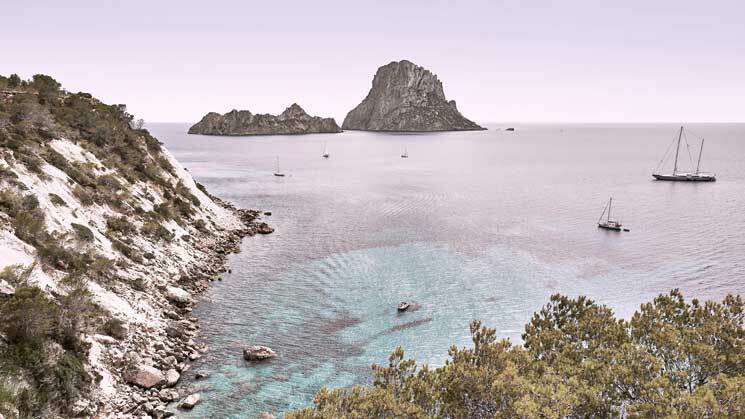 The new Seven Pines Resort Ibiza does look to be something rather special. 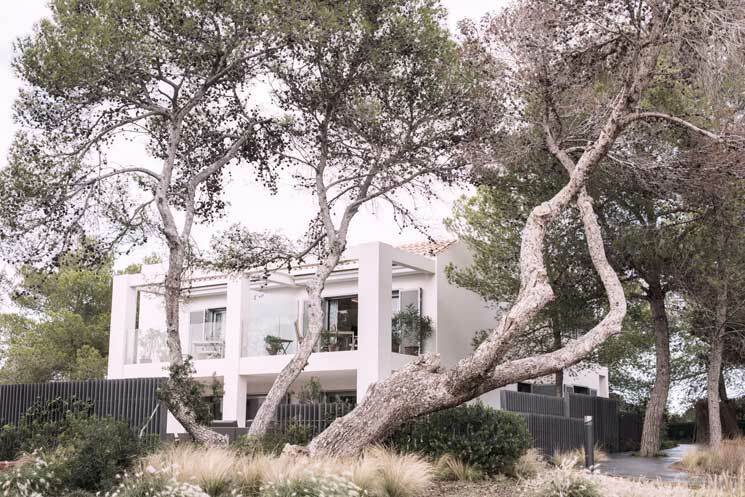 For many people, the location of Seven Pines will be known to them from days on the water as the spectacularly positioned, unfinished development, midway between Cala Conta and Codolar. How many of us have said ‘what a waste, why doesn’t somebody finish that?’ over the last few years? Well now they have. Jörg Lindner and Kai Richter are the managing partners of German development company 12.18 Investment Management. Their company blurb states that “(the company) firmly believes that only something special and unique can be successful in the long term and combines economics and ecology, efficiency and growth”. 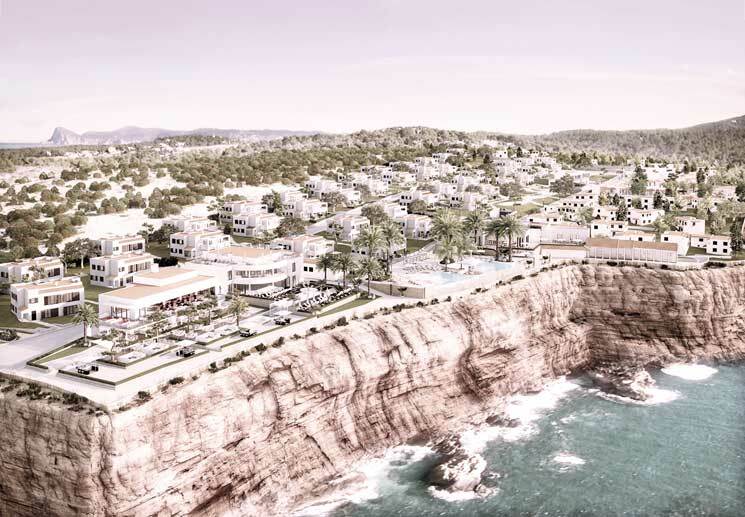 Any new Ibiza development is bound to be scrutinised for its environmental impact. Environmentalists will want to hold them to their word in combining economics and ecology, however in this respect they already have a huge advantage in that their development is that of, what is in effect, a brownfield site. 12.18 employ 1,100 people in their owned and managed hotel and leisure sector properties, the hotel arm of which extends to a shy short of 4,500 beds based on 183 million euros of investment. The Cala Conta Seven Pines Resort opens May 2018. With the sea to one side, and pine forest to the other, the Seven Pines Resort extends to some 56,000 square meters. 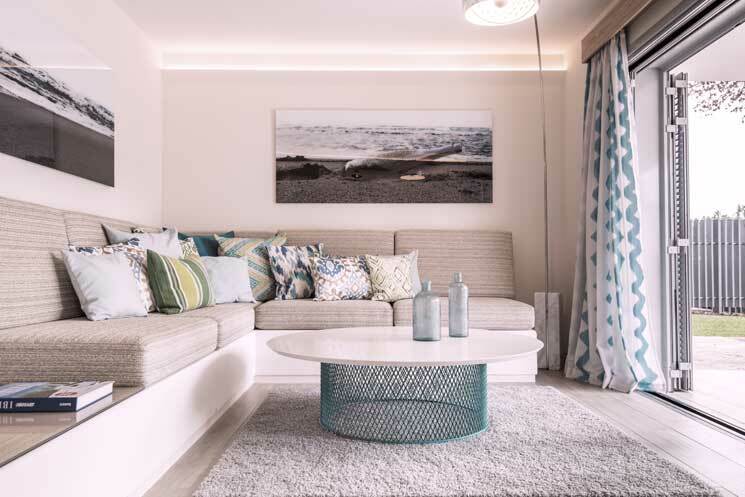 The all-suite clifftop resort is described by the developer as “set in whitewashed Ibicenco-style homes that respect the island’s authentic design with contemporary touches”. The Resort has 186 suites along with restaurants, bars, a full service spa, pools and gardens, and if that isn’t enough they even have their own Pershing yacht available for guest transfers and private charter. The suites at Seven Pines are set in sprawling gardens in a village-style configuration. The open plan one and two bedroom units can be combined to create a private Villa incorporating several of the individual units. Decor is described as “contemporary yet comfortable” with a consistent style of neutral tones with turquoise accents throughout the resort. The largest of these also have their own swimming pools. Located in the heart of Seven Pines is a collection of Pool Suites each with terraces or balconies, and a central lagoon-style swimming pool with its own chiringuito-style bar. There are also outward-facing suites with their own swim-up pool, with which the developers have aimed to create the feel of a resort-within-a-resort. In a prime position for the sunset are four two-bedroom Cliff Suites with private gardens and pools. Each room also comes equipped with its own House Bar and Illy coffee machines, allowing a private retreat if required. Gastronomy at Seven Pines is led by Food & Beverage Director Francois-Xavier Fiorilla – with a career that started in Paris and has come to Ibiza following a dynamic culinary background in Spain, New York, Chicago, Dubai and Beirut – together with Executive Chef Bijendra Yadav. Due to Bijendra’s private and professional travels around the world he creates unique tastes within the culinary outlets of the 7Pines Resort. His influences encompass Nepal (where he was born) via Darjeeling and the UK – including The Savoy in London – and time spent with Japanese chefs and extensive experience in the Middle East. The View restaurant has an enviable clifftop position and views out to sea. It is open for breakfast and a la carte dinner to hotel guests and visitors. In the evening at The View, Chef Bijendra will create simple yet exciting European gastronomy using Korean cooking techniques such as steaming, fermentation and Robata grill to bring out the fresh produce’s exquisite flavours. The restaurant’s Chef’s Table – set around an open kitchen – will have its own special menu and allow close interaction with the chef. The Cone Club restaurant is ideal for relaxed drinks and comfort dishes – Mediterranean sharing plates with Arabic and Asian influences – based around big community tables creating a warm, bohemian inspired atmosphere. The Pershing Terrace provides another superb sunset spot. Utterly unique, the Pershing Terrace is a sophisticated cocktail bar and the first in the world that has been designed by the Pershing Yacht team to emulate the vessels’ clean lines. It will enjoy views of the sea and glowing torches to set a chic atmosphere accompanied by a chilled-out playlist. The Pool Bar at the resort’s heart, the infinity pool, will serve finger food and light cuisine alongside refreshing beverages. 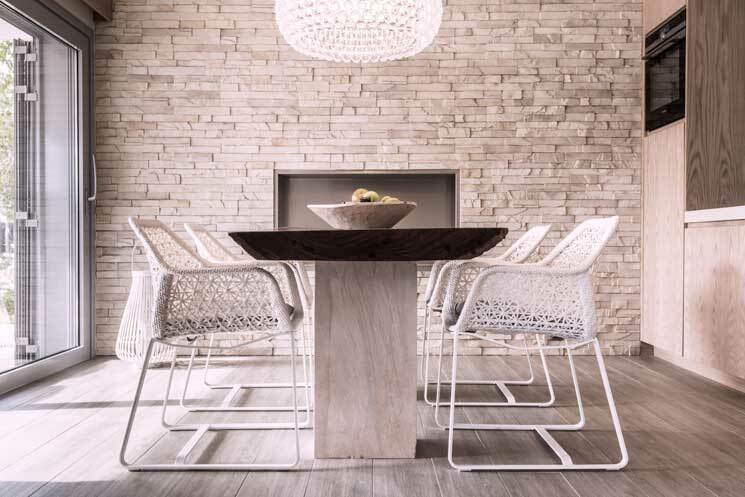 Seven Pines Resort Ibiza will also offer in-room dining that can be ordered through the resort’s own app, serving a menu of fresh soul-satisfying delights such as creative salads, dishes with Cambodian influences and light cuisine with Middle Eastern spices – all delivered by bike and served on natural, bio-degradable tableware. Guests in the larger suites will also be able to order a private BBQ chef who will come to the suite’s garden and cook a feast on the grill for family and friends. For an even more celebratory feel, a bar and mixologist can also be arranged. 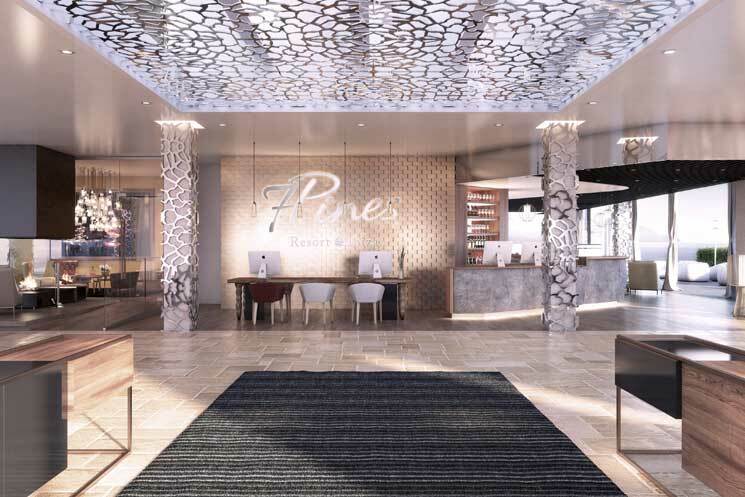 A 1,500sqm “oasis of pampering”, Pure7, The Spa at Seven Pines Resort Ibiza will offer a wide range of “relaxing, rebalancing and reinvigorating treatments will seamlessly blend natural and organic elements with the latest cosmetology”. The spa is comprised of six treatment rooms including a spa suite for couples, complete with a private balcony, a thermal circuit (including steam bath, sauna, cold mists and water beds), and beauty space with salon services that include manicure and pedicures, hair and make-up. The Resort is bound to prove a popular choice for high end weddings, and Seven Pines also aim to work in the corporate entertainment and conference/events markets. Seven Pines will be a year-round resort. Rates vary within season and occupancy, however “guests will be able to experience the resort starting from around 590€ per night. We had a look at availability online – and though accepting the upper end of their tariff may be a little beyond the humble means of your local newspaper editor, it is the most expensive we are all interested in right? 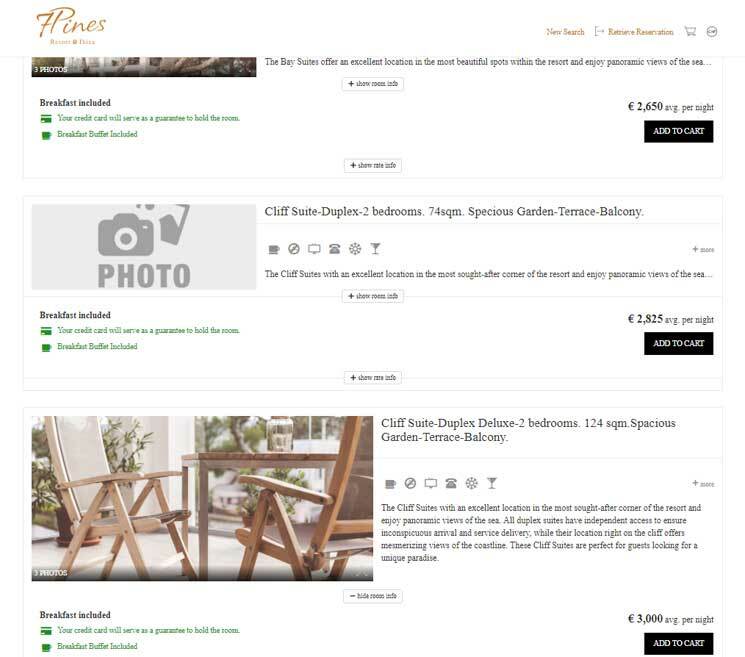 The booking engine was appalling on our visit – surprisingly so for such a high end site. If it were a budget 2 star I’d have given up on the impossibility of selecting the required arrival and departure dates without the system jumping all over the place and randomly choosing whatever date it seemed to find fit regardless of your selection. Finally having fixed in place a 9 day stay late August to September (I wanted a week in June, and the glitches were nothing to do with availability), the entry of ages for my 2 children was counter intuitive, with the site appearing to be working but actually requiring me to re-search. On finally getting to something I’d book, I scrolled down to find the two ‘best’ available options, far from immersing me in images of unbridled luxury, reflected the two Cliff-Top Duplex suites with one broken picture, and another of what could be some Homebase garden furniture. Underwhelming. I didn’t proceed to booking, and I would think even the most well heeled 2 + 2 families would be reluctant to enter their credit card information to a website with the Seven Pines website’s mind of its own.